CHARLESTON, WV--(Marketwired - Jul 16, 2014) - By the time couples find themselves at the altar, they generally like to have a few issues settled. From deciding where to live, to determining a budget, the topics can be as delicate as they are critical to engendering domestic bliss. But for couples planning a wedding in 2014, the Charleston Marriott Town Center is making the financial piece a little simpler. Its limited-time wedding package is so inclusive, it makes planning the wedding as fun and stress-free as taking the honeymoon. 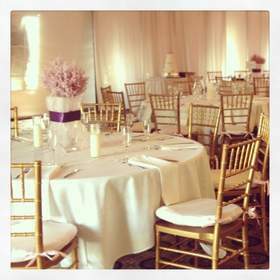 The Charleston Marriott Town Center has long enjoyed a reputation for being a premier wedding venue in Charleston, WV. Its elegant ballrooms, dramatic rooftop pavilion and top-notch catering options make it a distinctive choice for discerning couples. But its latest package makes all that even more affordable as well. Available for just $30 per person plus tax and gratuity, the package includes a one-hour reception with crudités and refreshing golden-citrus wedding punch, followed by a plated dinner of seared chicken breast with garlic-herb jus, garden salad, chef's selection of vegetables and assorted rolls. Another pocketbook-friendly perk is the discounted room rate for wedding guests. Just as the hotel specializes in ethnic weddings, custom celebrations and LGBT unions, its gracious hospitality is an appealing answer to the question of where to stay in Charleston, WV. Guests experience the pinnacle of modern hospitality, courtesy of the hotel's recent multimillion-dollar renovation, and the property is located next to all the best Charleston, WV attractions like the Charleston Town Center and the University of Charleston, which makes sightseeing before and after the big event a breeze. Available only through 2014, the package may not answer all of life's big questions for a couple, but it will get them started out on the right path. At the Charleston Marriott Town Center, travelers find themselves welcomed by modern style and genuine hospitality. Following a multimillion-dollar renovation in 2012, the lobby and all 352 guest rooms and suites feature a fresh aesthetic and enhanced productivity with features like large desks, ergonomic chairs and high-speed Internet access. The concierge level offers additional luxury via enhanced guest rooms and complimentary breakfast, hors d'oeuvres and drinks. This whets guests' appetites for the seasonal dishes and local ingredients of the hotel's Brick Salt Bar + Kitchen. And with 16 meeting rooms and 17,500 square feet of space, no event is too big or too small to be made spectacular at this distinctive destination. Couples can take advantage of the Charleston Marriott Town Center's limited time wedding package and spend their special day at a premier wedding venue at a discounted rate.